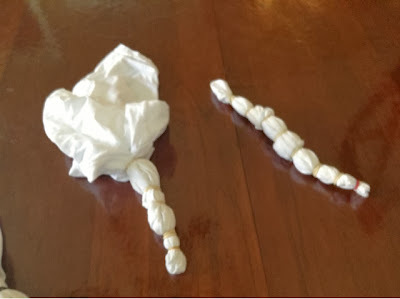 Today’s Throwback Thursday is a craft from 2011 and updated in 2013. 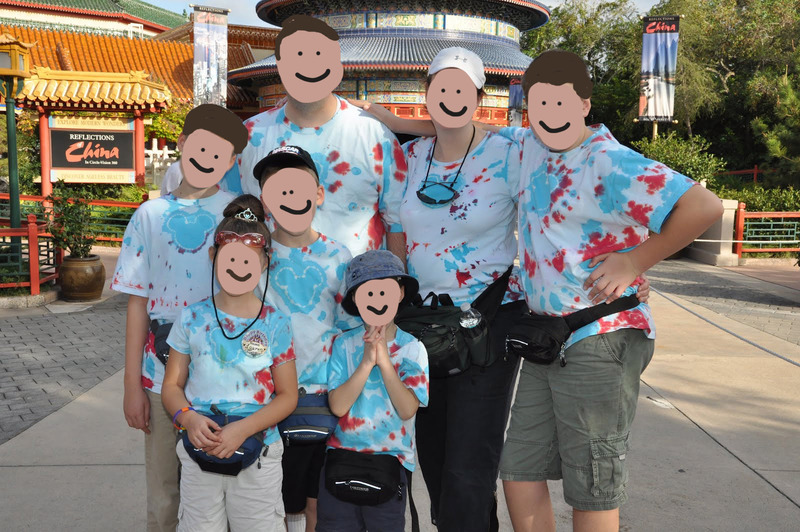 I made matching shirts for our family. Originally I did it because I had seen the idea on social media and thought it would be really fun for us. Since then I have learned that dressing identically helps a lot in crowded locations. 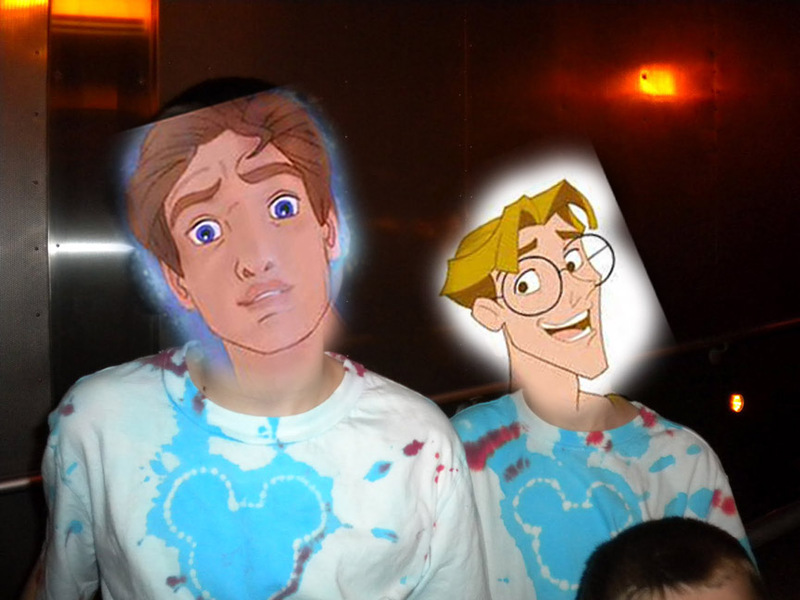 It makes it so much easier to spot each other. It also makes it easy when and if, despite my best efforts and constant head counting, one of my children wanders off or accidentally gets left behind by the group of cousins she is hanging out with. I can let personnel know my child is wearing the exact same shirt as I am and they can describe it on the radios immediately. It makes finding them fast. 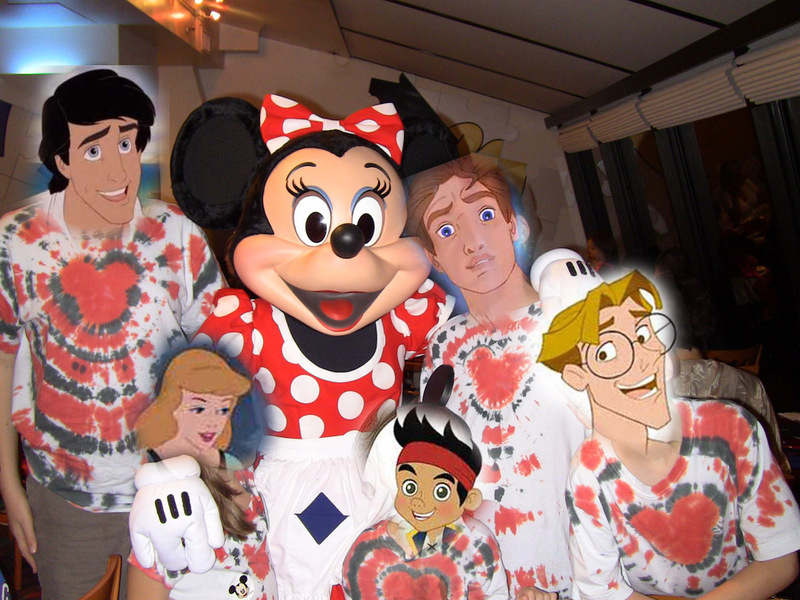 Oh, and I’m better at Photoshop manipulation these days, but these photos make me laugh, so I’m keeping them this way. So how did we do them? Easy peasy. 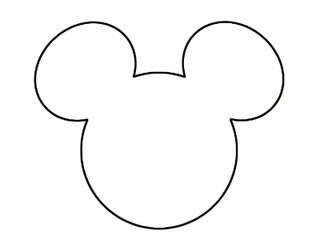 1) I downloaded a template of Mickey Mouse ears. 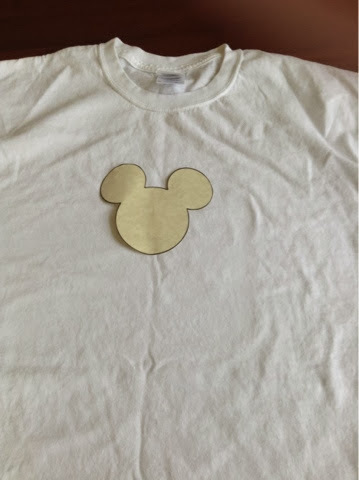 2) Next I traced that template on our shirts in pencil. 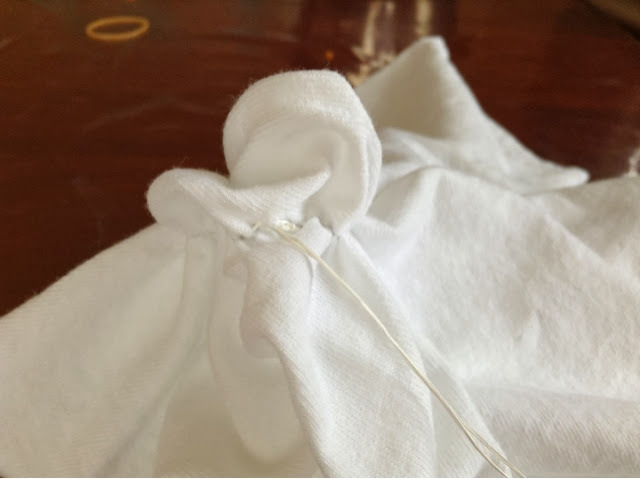 3) I sewed around the Mouse ears with dental floss. I’ve read you should use waxed. I used the teflon slippery kind. 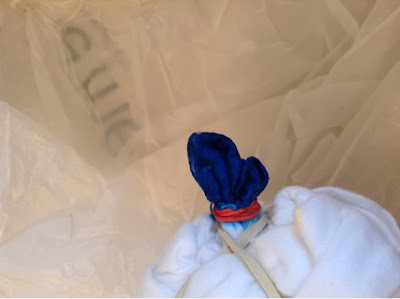 4) I pulled the dental floss tight to make a puckered “balloon”. Now this is where I diverged on the two techniques. 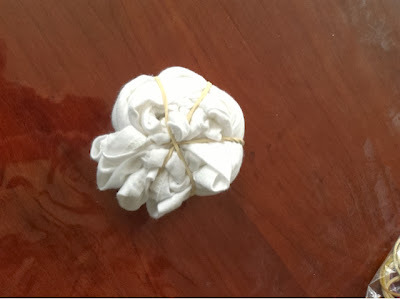 By the way, I skipped the soda ash step some tutorials recommend. 1) I put rubber bands around the puckered balloon to keep it separate. 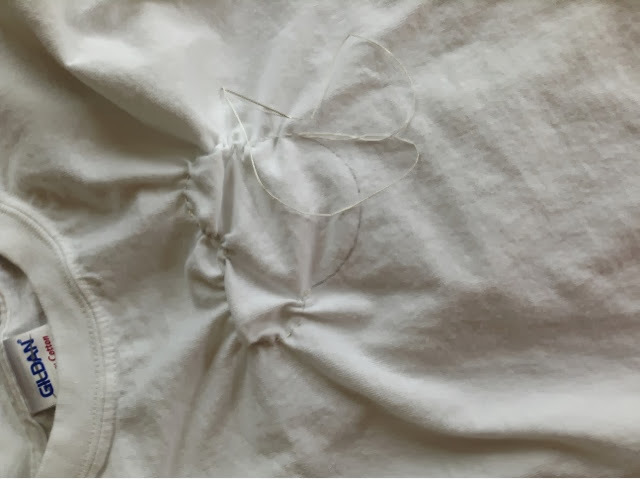 I did mine right on the line of the floss–I’ve since read you should make sure it is below it to keep it pretty separate. 2) Using the puckered balloon as the end, wrap rubber bands to section off the shirt.. By the end it should look something like a snake. 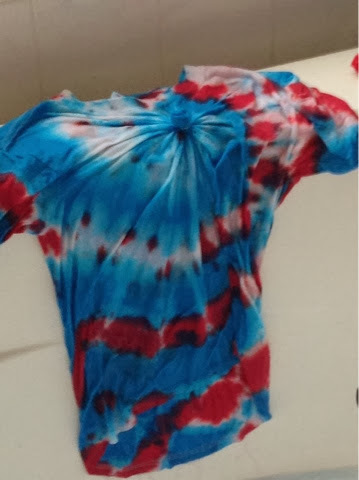 3) Use fabric dyes in any pattern you want until each section you want colored is colored. For more coverage, make sure you get into the folds or grooves of the shirt. 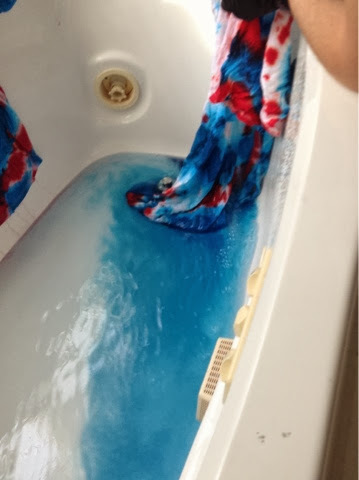 If you want more white to show through, leave some space between dye areas. 4) Be careful not to let dyed sections touch each other–color will transfer. 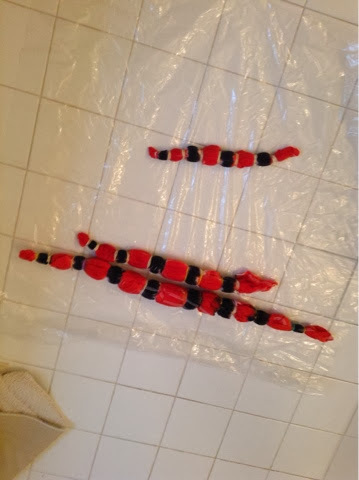 My two “snakes” are a little too close. 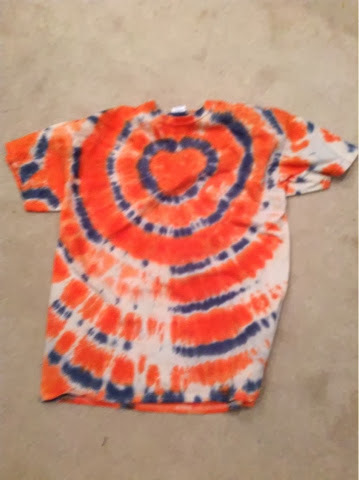 Also, I got some color transfer when I had the shirts on the grocery store bags. The ink from those rubbed off onto the orange sections. 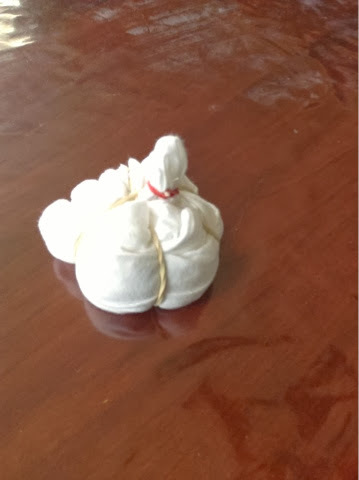 5) Wrap in plastic and let it sit for a day or so. Sorry no picture of that, but what I did was use the plastic sheeting in the above picture. 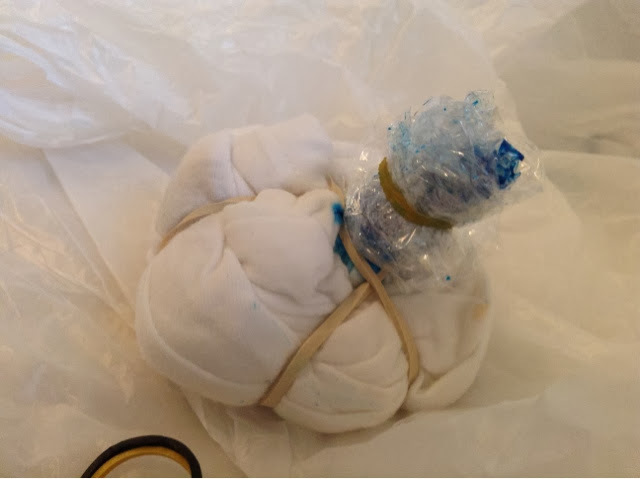 I wrapped the first shirt, then added the second, and then the third keeping the clear plastic between each additional shirt. 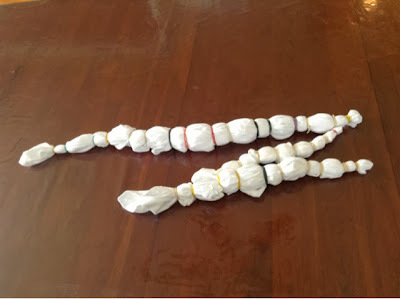 I then wrapped the whole thing together and put it in a plastic bag for a couple of days. 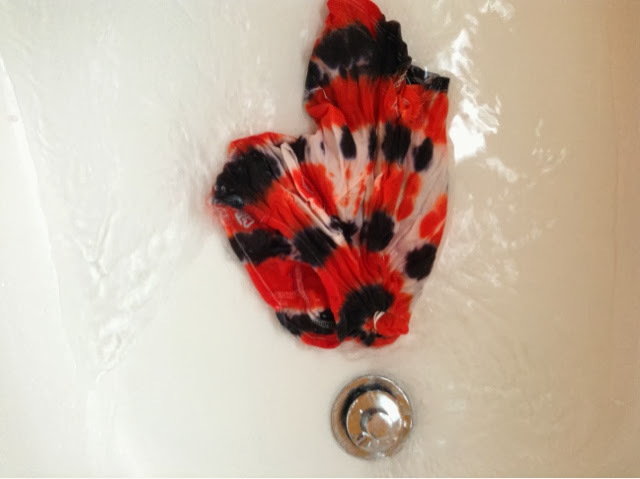 6) Rinse your shirt until the water runs clear. 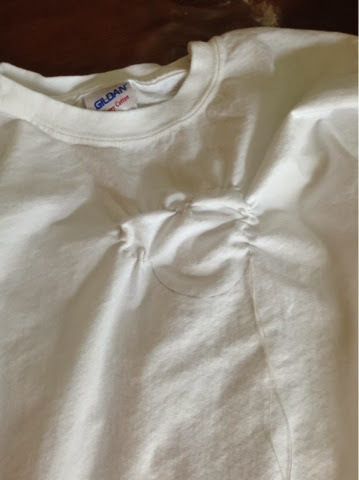 1) Lay your shirt flat with the Mickey poking up in the center. 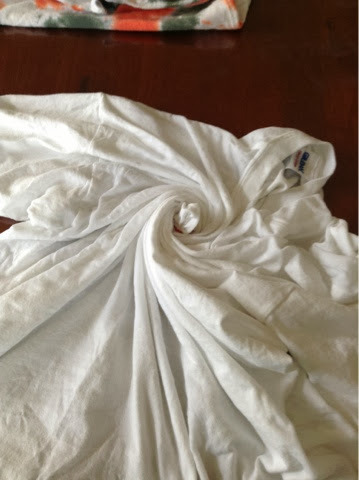 2) Take the Mickey and twist it clockwise gathering up the shirt as you go. 3) Once the shirt resembles something like a fat disk, carefully wrap rubber bands across it dividing the shirt like a pie. Keep the Mickey head poking up. 4) Color the Mickey head with fabric dye–wrap with plastic wrap and secure with elastics. 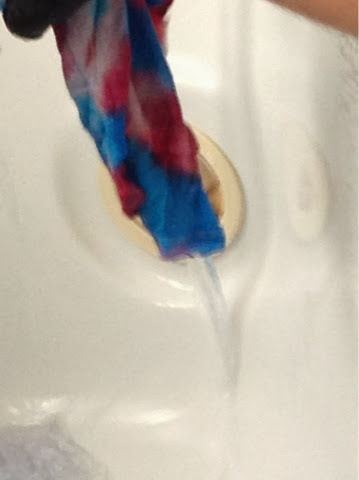 Then use the fabric dyes in any order you want until on the pie until each section you want colored is colored. 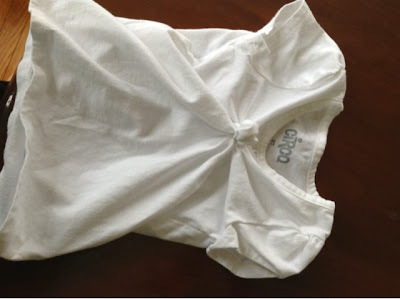 5) For more coverage, make sure you get into the folds or grooves of the shirt. 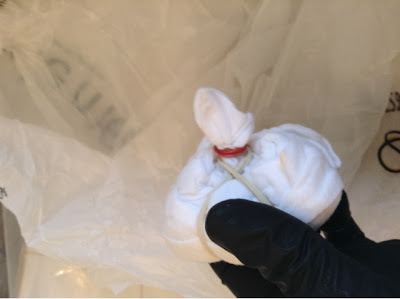 6) Be careful not to let dyed sections touch each other–color will transfer. 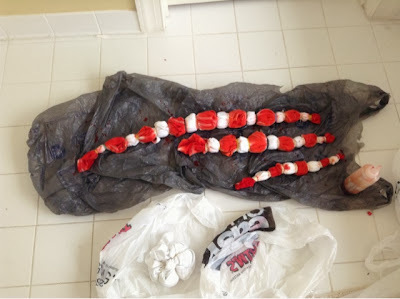 7) Wrap in plastic and let it sit for a day or so. 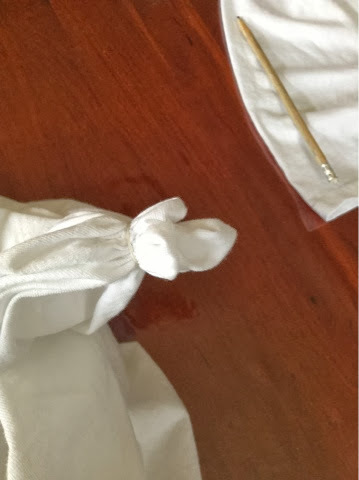 Once the dyes have set for a day or two, unwrap each shirt and run under cold water until the water run-off is clear. 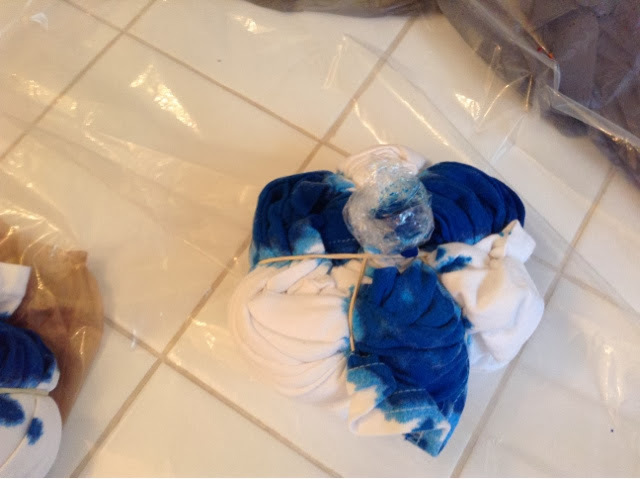 Dry the shirts and wash them again. 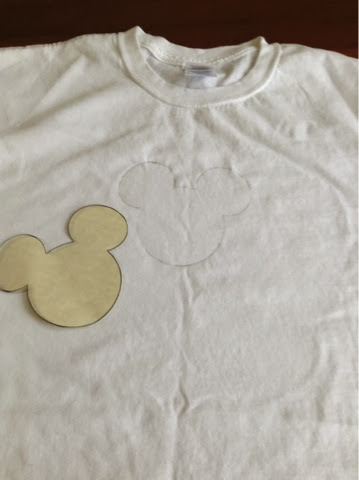 On the blue and red Mickey shirts, the stitched Mickey didn’t show up well. To rectify that I tried using bleach pen to trace the outline. That didn’t work too well, so I used a bleach with a toothpick and a q-tip to trace the out line and that worked much, much better. Fall 2013 note: I made the original shirts a couple of years ago and I had really large dye bottles which still had red, blue and black. I thought I could just reuse them. The blue came out fine, but the red turned pink after the final wash and the black is really more navy blue at this point. I finally bought new red dye because the pink was unacceptable to me. It worked out fine. Other tutorials with photos here and for swirl pattern here. Cutest video of both techniques here.